« Should you use eBay Cross Merchandising? 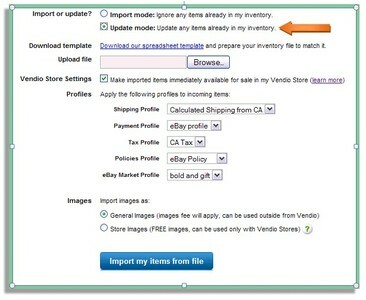 If you have ever wanted to do mass updates to your items, you can now do so on the Vendio Platform. Located under Items>Import, select CSV, download the template and make your changes and upload. Leave fields blank that you don’t wish to update. Updates are based on SKU (Inventory number), so any updates you make will be applied to an existing SKU. You can update multiple times, so don’t try and fit everything into one update. We’ll even provide an update history. Try and group your updates into groups of not more than 500. Make sure that you don’t set any conflicting data, such as selecting an auction format and not putting in a start price or beginning a sale in your Vendio Store and not putting in a start and end date. Under Import>Items>CSV Import view the “How to prepare your import file” document to view all the available fields and get additional tips and information. Wishing you Happy Holidays and Happy Selling!! This entry was posted on Wednesday, November 25th, 2009 at 10:30 am	and is filed under Vendio Platform. You can follow any responses to this entry through the RSS 2.0 feed. Both comments and pings are currently closed.